The history of the University of Göttingen starts with the creation of a library in 1734 and the founding of the University three years later. Established in the spirit of the Enlightenment, the Georg-August-Universität was free of censorship. The Faculty of Theology did not hold a dominant position over the other Faculties, as was usual up to this time, and academic teaching enjoyed high standing. The Göttingen Academy of Sciences and Humanities, founded in 1751, gave lecturers at the University a forum where they could discuss their scientific research and find the opportunity for interdisciplinary exchange. In the University's first heyday, scholars of worldwide repute took up professorships in Göttingen, for example the physician, researcher-naturalist and poet Albrecht von Haller, the physicist, philosopher and author Georg Christoph Lichtenberg and the mathematician and astronomer Carl Friedrich Gauß. Göttingen also came to be known in the context of protecting rights and freedoms: when in 1837 King Ernst August of Hanover rescinded the constitution enacted by his predecessor, seven professors at the Georgia Augusta, among them the scholars Jacob and Wilhelm Grimm, submitted a written protest. This brave act of opposition led to the ‘Göttingen Seven’ losing their positions and the number of students at the University falling to a historic low. But to this day, the actions of the ‘Göttingen Seven’ stand as a striking demonstration of civil courage in Germany. Early in the 20th century the University experienced a second phase of special glory. Göttingen was a hub for outstanding science and scholarship. 1907 saw the founding of the world's first national institution for research in aeronautics. From this emerged today's German Aerospace Center (DLR) and the Max Planck Institute for Dynamics and Self-Organization, institutions where key knowledge in the field of aviation has been generated. Numerous eminent researchers lectured or studied in Göttingen during this period, many of whom were awarded the Nobel Prize for their work carried out here: Otto Wallach (Chemistry, 1910), Walther Nernst (Chemistry 1920), Richard Zsigmondy (Chemistry, 1925), Adolf Windaus (Chemistry, 1928) and Werner Heisenberg (Physics 1932). In 1954, Max Born, Professor in Göttingen from 1922 until he was forced to emigrate in 1933, received the Nobel Prize for Physics for his ground-breaking research conducted in Göttingen. In the years 1933 to 1945, Göttingen University's tradition of free thinking was ruptured, with devastating consequences: Göttingen academics put up little resistance to National Socialism, its inhuman ideology and its racial fanaticism. As a result, political conformity was swiftly imposed at the University, numerous professors forced into retirement, and students ex-matriculated in large numbers. After WWII, a process began to restore Göttingen as a centre of science and scholarship. It was in Göttingen that the Max Planck Society, formed in 1948 with decisive input from Max Planck and Otto Hahn, was founded as an autonomous body for the pursuit of basic research. Today, the city hosts five Max Planck Institutes, the densest concentration anywhere in Germany; in 1977 this constellation was further enriched by the addition of the German Primate Center, a member of the Leibniz Association of Research Institutions. In the 1950s, decisive impulses for the strengthening of democracy and the rule of law again came from Göttingen. Film director Veit Harlan (‘Jud Süß’), a former Nazi sympathizer, faced hefty protests between 1951 and 1952 when he tried to shoot new films in Göttingen. And when three years later Leonhard Schlüter, who had been involved with an extreme right-wing party and published work by authors with radical right-wing tendencies, was made Minister of Culture in Lower Saxony, the Rector and Deans of the University resigned their posts in protest. In April 1957 some of the most distinguished researchers of the day, among them Otto Hahn, Werner Heisenberg and Carl Friedrich von Weizsäcker, issued the ‘Göttingen Declaration’, in which they voiced their opposition to the government's plans for nuclear armament of the federal armed forces. 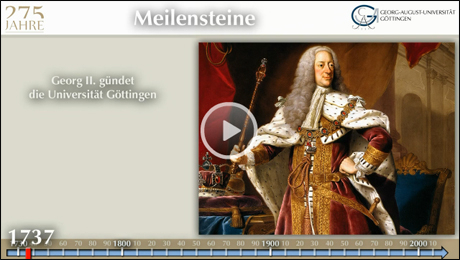 Göttingen past and present is characterised by the quest for excellence in science, scholarship and education. Its success is reflected by the long list of Nobel Prize laureates associated with Göttingen, including the Max Planck researchers Manfred Eigen and Erwin Neher who continue their work here today. Göttingen stands for exceptional progress in science and scholarship and for an exchange of ideas, impulses constantly sent out from this city into society at large.